2. Press"+"button to increase pedal assist level from "low" to"mid" and "high". 3. Press"-"button to decrease pedal assist level from "high" to"mid"and"low". 36V/8AH Removable Lithium Battery can be charged on or off the frame, equipped with smart lithium battery charger can make you ride up to 25-50 km. Fast charging only need to 4-6 hours. 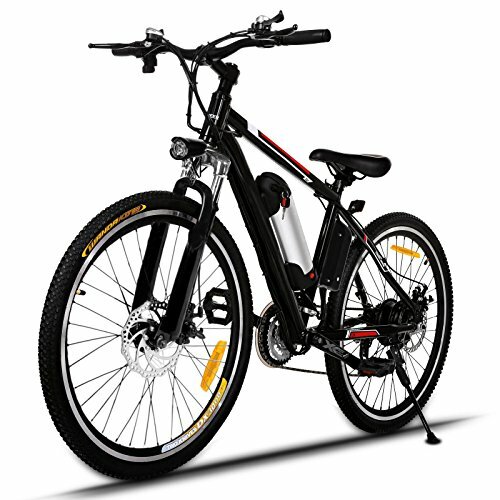 Electic Bike use 100% aluminum alloy frame, the front fork is made of high-strength carbon steel and packed with premium comfort shock absorption. The front and rear wheels are double layer aluminum alloy wheel. 250W high speed brushless gear motor easily assists you to travel at the 15mph road speed limit. Meter has 3-speed smart button, you can adjust the suitable speed at any time. The front and rear disc brakes, perfect brakes fully guarantee your safety. 21-speed transmission system, you can complete a exciting journey. The horn and the bright LED headlamp are equipped for night riding. Two modes（E-bike & Assisted bicycle） can be switched at any time. You can choose the E-bike to enjoy a long time travel, and also exercise; combining two mode would be a better choice. With one-year warranty for the electric motor, battery and the charger, you've no worry using it.